Fly freely around star systems soon. 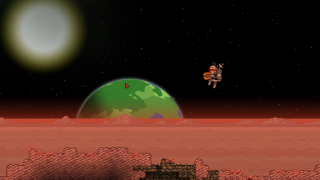 When it's not working on its two new games, Starbound developer Chucklefish finds the time to update, well, Starbound, its spacey, science fiction sandbox game. True to that, a new post on the Chuckleblog sheds a bit of light on an upcoming patch that will revamp the way space travel works. You'll soon be able to fly freely around star systems in your little pixel spaceship, or in a bunch of new vehicles that will be added as part of the update. Here's a GIF that shows the work-in-progress system off (I do like how your craft appears to automatically orbit planets if you get close enough). "Space isn’t just about stars and planets," Chucklefish's Molly explains in the update post, "it’s about the space between them, so you’ll now be able to fly freely around systems and explore all kinds of new locations, from space stations to traveling merchant ships to mysterious derelicts! Systems won’t just be static, either—moons orbit planets, planets orbit stars, and rich opportunities come and go, rewarding patient explorers with brand new perils and plunder!"